Okie dokie, we are officially getting a pool. When I say officially, I mean this is how we started our Wednesday morning. The kids and I made a deal regarding their homeschool lessons. They could get up and check on the progress of the pool often as long as their work was getting done. Immediately they jumped up from the kitchen table and ran to each window of the house, comparing which windows had the best view. They agreed on one of their bedrooms and took their positions. This is the view from my son's bedroom window. The backhoe was so close if felt like we could have reached out the window and touched it. From our backdoor window. So close!!! I must say, it is an odd feeling having that much equipment in your backyard. We made it through our school day. The kids did an amazing job of staying focused on their work. The crew is now going on hour eight of digging and aren't showing any signs of stopping. I think they will be able to finish the hole today. The next step is re bar. Well, it is that time of year again...back to school. You know what that means, it is time to get ORGANIZED!!! It is time to make those dreamy trips to office supply stores and smile at all the adorable school supplies and crafts. I am a bit of a supply queen - I love brand new office, teacher, and craft supplies (esp. Sharpies and Post-Its). 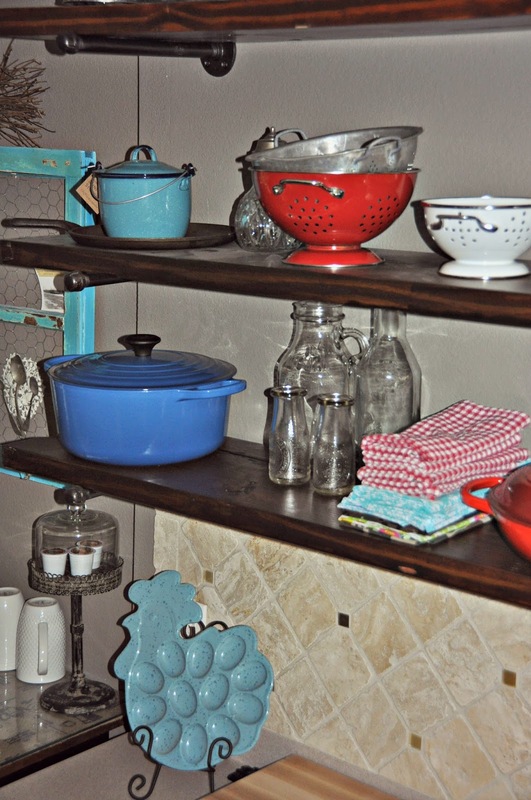 With all of these great goodies, it is easy to spread clutter and disorganization all over your home. 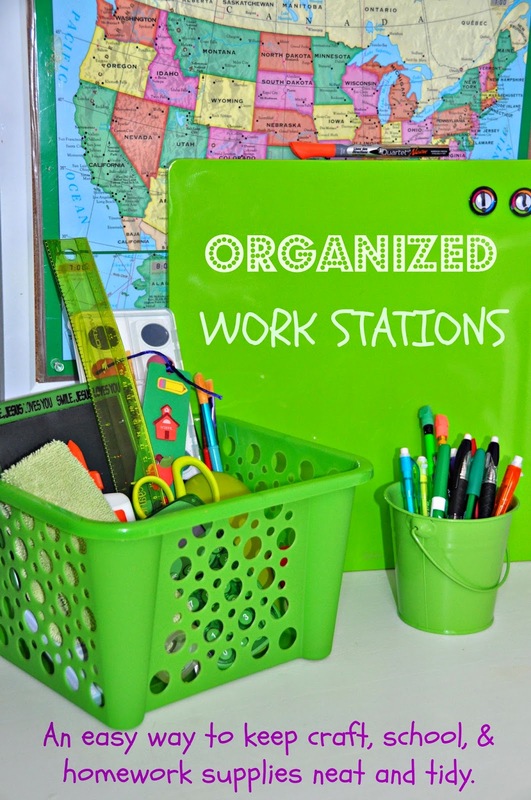 Using three organizational items, I have been able to keep all of our essential supplies neat and tidy. Plus, since I home school (and we started our lessons mid July) I have already had the opportunity to use these items and make changes to meet our needs. I guess you could say I have given this system a crash course and it passed with flying colors! The dry-erase board is great for so many things. It is awesome to use in place of paper when practicing math, spelling words, letters/numbers, and handwriting. I know my kids find it fun to use, which always makes things easier in my house. It could also be used for chore lists, homework lists, and small notes to one another. The list is really endless. Plus, the boards I purchased are also magnetic which makes me love them that much more. My kids have gotten so much use out of these boards. I customize each basket based on the child's age and supply needs. My nine year old's basket holds different items compared to my six year old and four year old. Aren't those little metal buckets the cutest? I have had those for a couple of years. We have used them from pencil holders, to ticket keepers (for rewards), all the way to paper clips, push pins, and anything else small. Originally, I bought these at Hobby Lobby. However, I was excited to see them at Dollar Tree a couple of weeks ago. The kids really enjoy using their favorite colors, as you can tell. It makes it fun and they get super excited when I add new things in "their own color". Last week, I wrote a post titled, Are You Sure God? (This Really Isn't My What I Had in Mind). I wanted to get all of my feelings and thoughts about trusting God's plan out on paper or should I say "blog land". Many times my blog is basically my personal journal. It helps me to sort through my thoughts when I take the time to sit down and write. This is the continuation of that post. Trusting God's plan is also trusting His timing. Naturally as humans, we want to know the plan, amount of time, and exact steps it will take to accomplish something. We basically want God to be like our own person Garmin, GPS, or OnStar system. We expect him to give us a step by step plan and instruction book on how each season of our life will pan out. Isn't this so typical? For the most part, humans are most comfortable when they feel they are in the driver's seat. We become frustrated, panicked, and much like a three year old having a temper tantrum when we don't understand the directions. Worse, we really throw a fit when we don't get our way or when something is not going according to OUR plan. When we behave this way (yes, I am guilty) we are pretty much telling God, "Move over, I can handle this on my own". Not only do we have to trust in God's plan, we also have to trust in His timing of how that plan will happen. That my friends, can be so hard; like hair pulling, stomping your feet, crying, temper tantrum throwing hard. It takes complete trust and deep faith to relax and allow God to work his mighty plans. 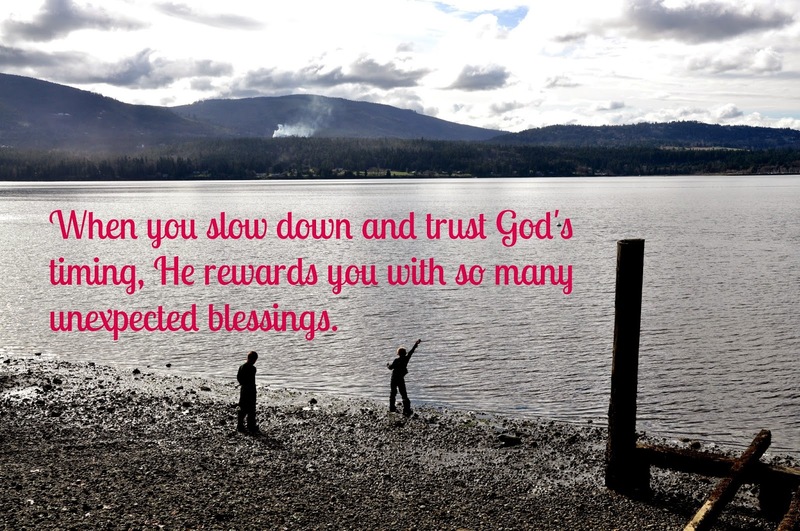 If we try to rush God's timing we will miss so many unexpected blessings. I love unexpected blessings, they are usually the sweetest. Have you ever had your entire day interrupted and thrown off tract? I am sure you have, if you are a mom this is almost a normal daily occurrence. Instead of getting flustered, try to breathe and just "go with it". When you finally do relax, you may be surprised to realize God had your best interest in mind the whole time. You will probably even be able to reflect on your day and find many small and special unexpected blessings. What is really crazy is that I am a total control freak, type A person and I am actually writing a post about letting go and trusting God's timing. My husband would probably agree that asking me to slow down and breathe is a miracle in itself. My mother is probably cracking up that I actually suggest people should relax and "just go with it" since that is the exact opposite of my personality. My goal in writing this post is to continue working on myself. Reminding myself to trust God's plan and His timing is a daily occurrence. But, every time I do I am rewarded and blessed in more ways than I could have imagined. This is a small example of trusting His timing. We had just arrived in Seattle, Washington on our family vacation. After the plan ride, crazy shuttle driver, getting lost trying to find our rental car, and shear exhaustion we finally made it to our hotel. It was something like 1:30am in the morning. Yet, just letting go and relaxing I got to live the excitement of being on vacation through my children. They didn't realize or care about the stress we had been through that day. They were just excited beyond words to be with one another on vacation. It was such a sweet moment and a small blessing that would have otherwise been over looked. I write this post with all sincerity, from the bottom of my heart, from a place of experience. With the school year starting and new activities beginning it is easy (as a mom) to get caught up in the "volunteer list". Do you remember the Brady Bunch episode with Marsha signs up for too many clubs? She finds herself stressed out, overwhelmed, and not able to give her best. We, as moms, have a way of doing this when it comes to our children. I remember I couldn't wait when my son to became old enough for activities. It was as if the race was on. This momma was out of the gate with a full speed start. The thing about going full speed is you tend to run out of steam quickly. I signed up to volunteer with every activity, club, committee I could find. I wanted to be "that mom". The mom that was involved in all aspects of all extra events. I wanted to be on executive boards and chair various committees. The problem was I became Marsha Brady. All too soon I was stressed out, overwhelmed, and not able to give my best. Have you ever felt like you couldn't spend quality time with your family because you were running around like a crazy woman organizing meetings, events, banquets, etc. for your children's various activities? Don't get me wrong, I think all parents should volunteer in some capacity. And unfortunately, it is usually 20% who do 80% of the work. However, we have to keep a clear perspective as to what is a healthy amount of volunteering. Am I volunteering because I truly have a love for that position/job or am I volunteering because I want everyone else to witness it? Does that make sense? I was caught up in the pride of feeling like everyone was counting on me. I enjoyed being part of the inside circle. I liked the feeling of being reliable. But here lies the problem, I was reliable for all the countless activities, committees, and meetings. I was not being reliable for my family. On top of it I would complain to my husband or snap at my kids because I was stretching myself to thin. Ummm, who signed up for these positions in the first place??? Is it really beneficial to my child if all of this volunteering is keeping me from spending real quality time with my family? That is a tough one. It was especially tough when I finally admitted the answer to myself. Also, it took me awhile to really feel comfortable with the answer. I decided it was time to drop a few things and re prioritize. Most likely, I will always volunteer but not to the same extent. I have learned it is okay to just be on the committee, not lead the committee. If you are a newer parent to the whole volunteer world, I encourage you to sign up and support the activities your child attends. But do not feel pressured or ride the guilt train that you have to be involved in all parts. Remember, you best memories are going to come from the quiet moments when you get to sit back and just watch your child. As I write this I feel this goes for any type of volunteering, not just specific to your children. Being involved is wonderful and very rewarding but when it causes stress and missed time with your family something has to give. Here it is, the new name and look!!! What was once A Cup, A Cup is now Right Where We Are - loving each season of life, even the messy ones. This has been several months in the making. It took me forever to figure out a name that I would not get tired of and would not have to explain countless times to everyone. :) I want to thank Susan Chilcoat at Chilcoat Studios for doing such a beautiful job with the look of the page. Susan and I will continue working together on small details of the blog. She was fantastic to work with and made the process a piece of cake. Thank you to everyone who has taken the time to read my posts. It just means the world to me that I get to spend a small part of the day with you. Please make sure to like the Right Where We Are Facebook page (click here). It will be getting a make over, as well as an Instagram page over the next few days. Buttons for FB and Insta will also be added to the blog in the near future. I don't know what it is about the tooth fairy but this is one area my husband and I cannot seem to get right. This is how a typical tooth fairy episode goes in our home. The innocent child is beyond excited that they have lost a tooth. They place it under their pillow with hopes and dreams of the tooth fairy paying them a visit. Hours go by, filled with sleep and dreams. We are awful parents! We look at a each other in a moment of panic. Then we run around frantically trying to come up with some little white lie to cover our lazy mistake. "Oh, here it is, she left your money by the front door." "Honey, she left the tooth by your bed because she thought you would rather keep it." "Her bag is just so heavy with teeth, she thought you wouldn't mind keeping yours." the guilt, the shame, the endless questions. "He got more money than I ever did!!!" What?! How could that be??? We ran upstairs to look at the coins, we thought for sure he was mistaken. Nope, apparently in my frantic state I had accidentally grabbed a Susan B. Anthony coin instead of a quarter. Ugh!!!! The pressure, this momma can't take it! Seriously, we need Tooth Fairy tutoring. Does anyone know where we can get that? I will Google it. So, you can feel good about yourself now. I am sure you have mastered this better than we have. I have made a change in my kitchen. 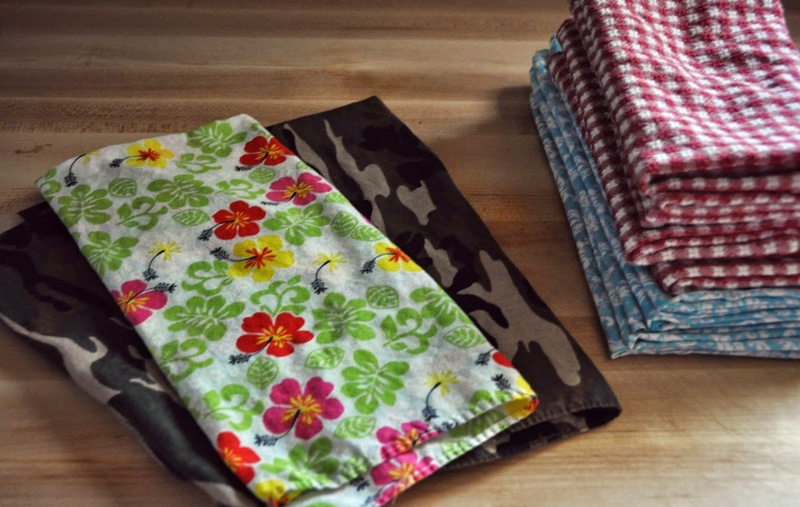 I decided to purchase cloth bandannas from Hobby Lobby and use those as napkins. They are only $.99 a piece so I figured buying 10 wouldn't be a waste. Plus, if we didn't like them or if they fell apart the kids and I could use them for a craft. The only problem was I didn't want the western look of a typical bandanna. I was thrilled when I saw the selection at Hobby Lobby. They had every thing you could imagine, as well, as the traditional look. While digging in my closest, I also found some red and white checked napkins that I received as a wedding present years ago. They matched the look I was going for perfectly. I must say I love the little switch I made. It adds a special touch to our meals. You may be thinking that they only add more laundry to the already never ending piles. 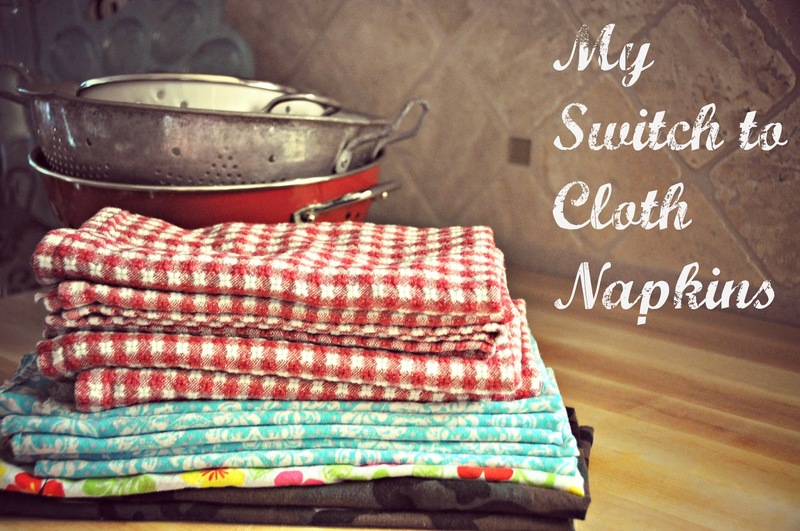 Not really, I just throw them in at the end of the day with any kitchen towels or dish clothes that need to be washed. Piece of cake! I also love how they looked when they are clean and freshly folded on our kitchen shelves. Exciting News - New Blog Name!!!! After many months of consideration and driving my close friends and family crazy, I have decided on the new name. The blog will be called, "Right Where We Are". The content will still be the same; a little bit of everything (homeschooling, faith/inspiration, girl talk, mommy stories, etc.). Basically, it is my description of our current life. We love it, wouldn't change it, but we are definitely in the thick of it! I hope you will continue to follow the blog. It means so much to me when someone takes the time to read it. I know how busy everyone is and I love that you are allowing me to be part of your day. Hopefully, in the next few weeks or months we will also be seeing a Facebook and Instagram page for "Right Where We Are". I will keep you posted!!! "Did I "hear" Him correctly?" "That can't possibly be right..."
"I'll just try it my way one more time." Has this conversation ever occurred in your mind? We are taught to listen to God and follow His plan. But what happens when God's plan doesn't line up with what you had in mind? You want to follow and submit but then the other part of you wants to have control. What if God is pushing you a direction you never dreamed about? What if the plan He has for you doesn't exactly line up with your peers or the "norm"? "That is a great idea God but you must have me confused with someone else." "Hmmmmm, Thank you for the idea God, but I think I will just "pray" about that." But once you decide to listen faithfully and follow His lead, everything just seems to fall into place. Did you know His promises in the Bible are actually true? :) Amazing, right?! Our human selves naturally question and try to control but we can relax when it comes to God's promises. He has us in the palm of his hand, holding us close, and yearning for us to follow his lead. Realizing that fact makes me relax and feel so much better. I can actually exhale. So when you are wondering if you heard Him correctly, breathe, relax, and TRUST HIM FAITHFULLY. He has it covered so you don't have to. Yay!!! At the end of today, we will have completed our first 20 days of homeschooling for the 2014-2015 school year. My husband and I decided a non traditional schedule would work best for our family. So instead of following our school districts calendar we created our own schedule. It is very similar to a year-round approach. We will work six weeks then take a week off plus allow for normal holiday breaks. We started mid July and will finish right before Memorial Day (the required 180 days of instruction). We are so excited that Labor Day weekend will kick off our first week long break! We are ready that is for sure. The rolling office chairs drive me to the point of wanting a drink and I don't mean iced tea. Those things were a horrible idea (cute but such a bad, bad idea). We seem to have forgotten how to use our legs and feel the need to roll every where. My mission right now is to figure out how to make those chairs stationary. The colorful trash cans under their desks are also driving me nuts. For whatever reason all three of my children feel the need to put their feet in them. What? Why? I don't know why this should be a surprise, but my children have a LOT (often strange) things to say. At times their words are wise or witty. Other times I just look at them and remind myself not to visit their apartments in college. I am definitely referring to the boys with this thought. Our youngest son sat at the kitchen table with eyes closed tight. He flapped his arms and then made a motion with his hand on his forehead (like a sailor looking for land). When he was finished he said, "Mommy, do you know what that means?" I honestly could not think of a response before he added, "It means I have lost my chicken." Without skipping a beat he just continued on with his lunch. Kids can pull a lot over on a teacher, they cannot pull much over on their mother. Nothing upsets me faster when a case of pure lazy sneaks into our classroom. I cannot stand to watch them attempt to just "get by" or not give their best effort. I love that all three (even our oldest) enjoy crafts. Even though most of the crafts are geared towards our four year old, the older boys expect to be included. They get such excitement from little things like smelly markers, stickers and stamps on their work. Not once has our oldest acted as though he is "too cool" for the small things. I have been surprised by our unplanned moments of education. We had an exterminator at the house due to a serious ant problem. The older gentleman was so sweet as he took the time to give the kids a mini lesson on ants and other colonizing insects. It just so happened that was our topic for Science that very day. We start our day with the Pledge of Allegiance, a Bible story or verse, and prayer journals...enough said. Boy oh boy am I working hard!!! For those who think homeschooling is the easy way out, think again. I taught dance for 10 years at a public high school. Keeping my three of different ages and different abilities on track is harder and more of a challenge (to me) then running a dance class of 40 girls. More than anything, growing 6 more arms and becoming more like an octopus would be ever so helpful. Homeschooling has been a great thing for our family. I finally feel like after years of struggle our family is finally right where God wants us. It is a great feeling... exhausting, overwhelming, crazy, great feeling. I am sorry my sweet children, but it is not my job to make every moment of your life seem like a party. These are the basic words that I stated to my three adorable children. We were in the middle of our morning lessons and everyone was acting as though they were either being tortured or bored to death. At that moment it dawned on me that children of this generation feel the need to always be entertained. I am sure it is not ALL children but I would bet the majority are growing up this way. I am the one to blame in our household. I love making lessons fun and creative. I love everything about Pinterest. But could it be that all of my attention to detail, craftiness, and fun has effected my children? Of course it has. It has effected them in both positive and negative ways. We have made amazing memories around crafts. I adore the pictures I have taken centered around creativeness. However, when we are in the thick of things (i.e. spelling words), they need to learn to just get'r done. We can learn spelling words by stair writing, color writing, shouting the letters while doing jumping jacks, etc. But at some point the words just have to be flat out memorized and sorry my sweet child that is just plain B-O-R-I-N-G. I want my kids to enjoy life but I also want them to understand that sometimes you just have to roll your sleeves up and get the work (the not so fun) work done. It is this type of work that creates perseverance. Anyone can keep going when things are fun. It takes real commitment and dedication to finish something that is not wrapped in a pretty package or attached to a prize. After all, it is the hard tasks that create character and allow one to grow. I want to be the one to teach these lessons to my children. If they can learn perseverance with something small (i.e. spelling words), they will be more equipped for larger challenges which come with each stage of life. The real world will not be so concerned about making everything seem as though it jumped off the pages of Pinterest. I want to make sure that know that before leaving our cozy little nest. We will still have tons of fun and creativity in our household, but we are also going to stress the importance that sometimes you just have to push through and get things done. I am sorry my sweet child, it is not my job to make everything in your life fun. However, it is my job to love you unconditionally and to teach you faith, perserverance, and true character. DIY Planked Wall - Bedroom Makeover - This is by far one of my favorites. Why? Because we finally took the time to work on OUR room. I loved the majority of our home but our bedroom was plain sad. We had focused so much of our time every where else. Isn't that how it normally goes? 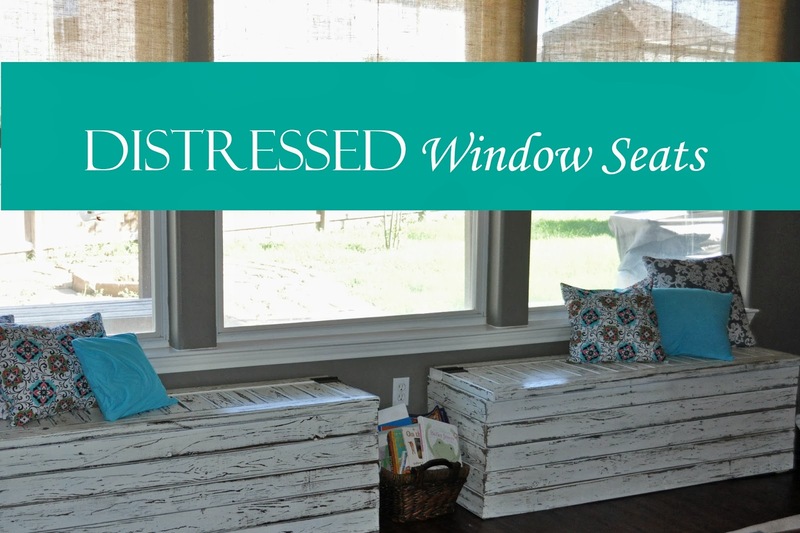 Distressed Window Seats - These are definitely the one item in our living room that gets the most comments. 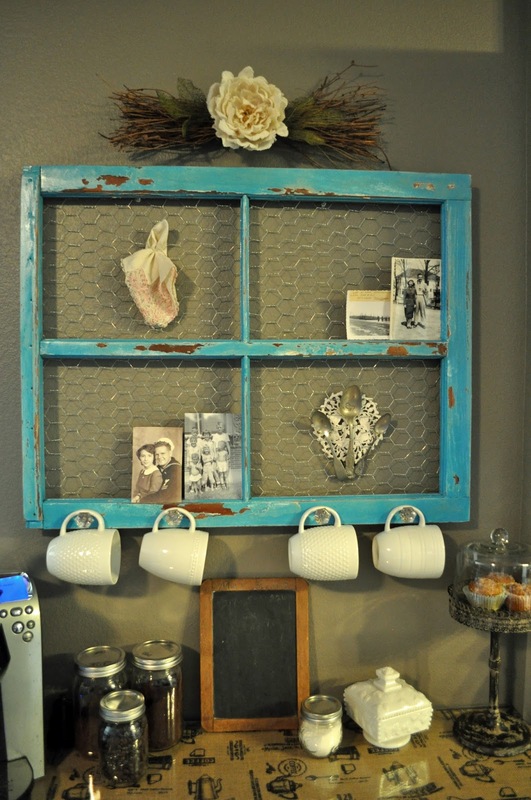 They have fantastic storage and I just love the distressed look. 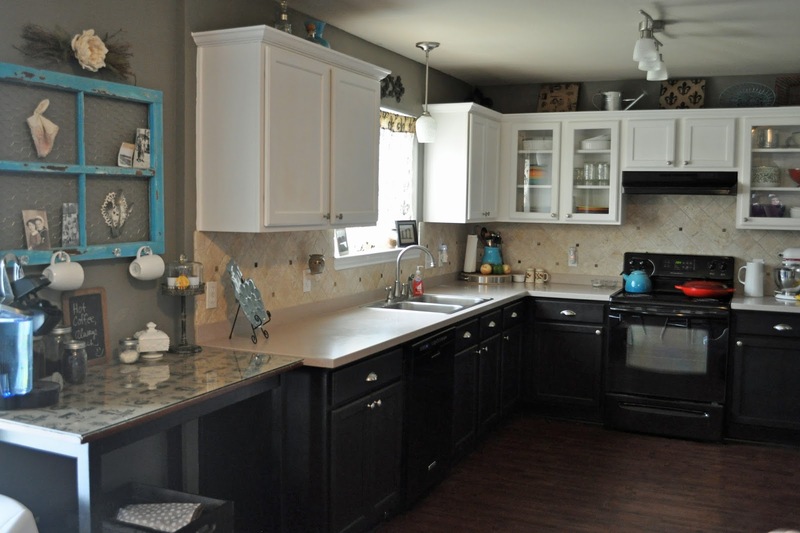 Kitchen Update - This was one of our biggest projects. Basically, every pot, pan, plate, and glass was in the middle of my living room while this project was being complete. The dust was insane, we had foot prints all over the house. I am surprised I didn't end up rocking myself in a corner during this one! 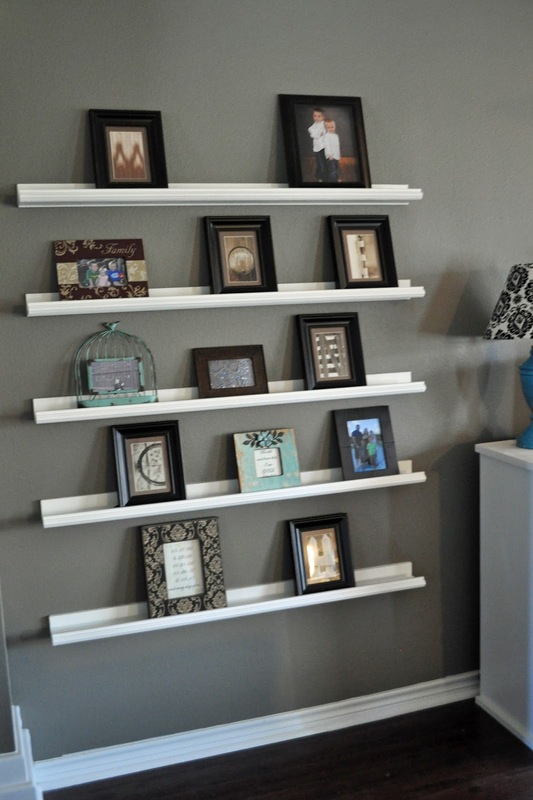 DIY Shelving - This project was so simple and added so much to our living room. Oh, I should also add, CHEAP!!! I love each of our projects, probably because we really put our heart into them. We have had such a great time turning our cookie cutter house into a home. If you would like to see any of the other projects please follow this link: A Cup, A Cup: Projects and Crafts. Good morning! Today, I am blogging over at Tater Tots and Jello. It is such a great blog with SO many wonderful ideas. I am beyond excited about this opportunity. I would love it if you would take the time to follow the link and visit. Over the next week, I will pick some of my top favorites from each category and highlight them in one post. Today, we will start with ORGANIZATION. Here are a few of my favorites. Household Management Binder/Printables - I love this post because it is very much the system we use on a daily basis. It it an easy system but does take dedication and a little bit of time. 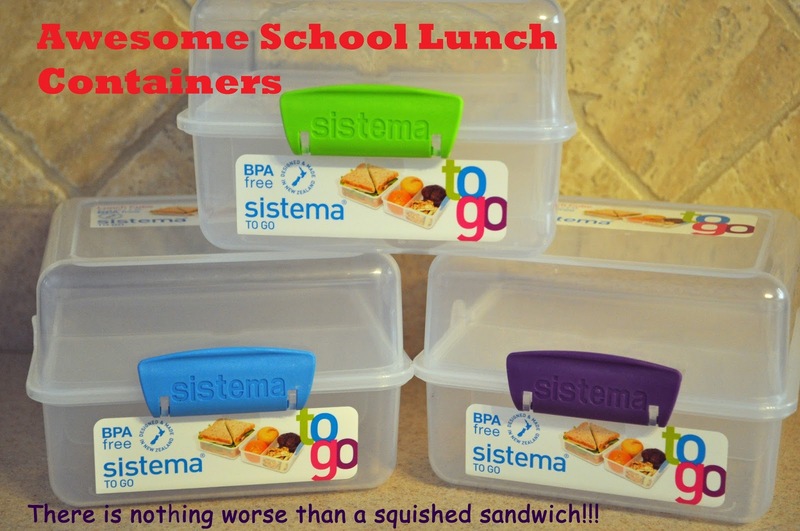 School Lunch Containers - These lunch containers are the best! I have run them through the dishwasher at least 100 times and they are still in great condition. Back To School Organization - We used the basket system for about a year. It worked great when our kids were in public school. It kept papers, back packs, and everything else nice and neat. Now that we home school our children, I will probably re purpose the baskets. Christmas Card Organization - I love sending and receiving Christmas cards. The problem is, I never know what to do with them at the end of the season. I cringe at the thought of throwing them away. They are to precious to be torn up and tossed in the trash. Plus, if every other mom works as hard as I do to get that one great pic, there is no way I am going to trash her card! I think this organization system is going to work out well. 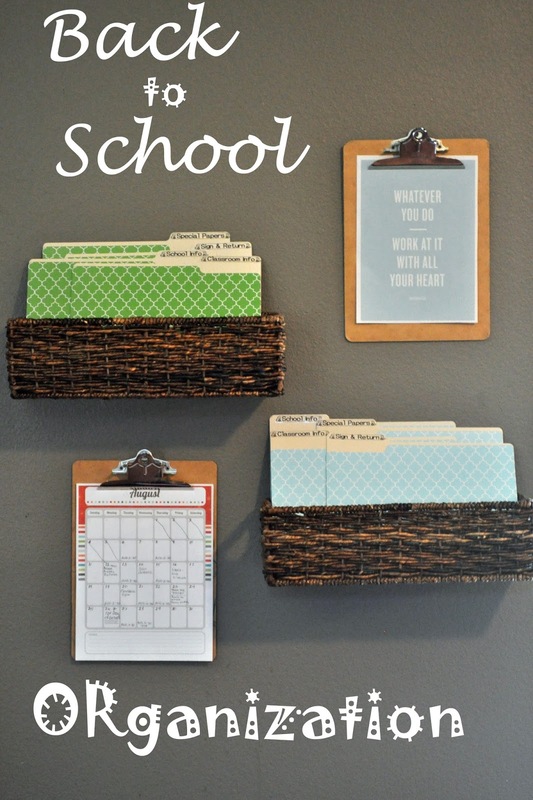 Home School Classroom - The way we organized our classroom has been such a great addition to our day. The desks, cork boards, and towers have worked out just how I had planned. Those are just a few of my organization favorites. For a complete list of A Cup, A Cup organization posts, please click the following link. http://acupacup.blogspot.com/p/organization.html. Tomorrow, I have a guest feature at Tatertots and Jello. I would love for you to hop over and visit. :) The post has to do with back to school organization. See you tomorrow. **** Thank you I Heart Organizing for a fantastic link party!